Your tour starts directly in front of the cruise terminal. An enthusiastic local guide will share insight into the local history and present with you and take you to the most prominent places in Warnemuende and Rostock. 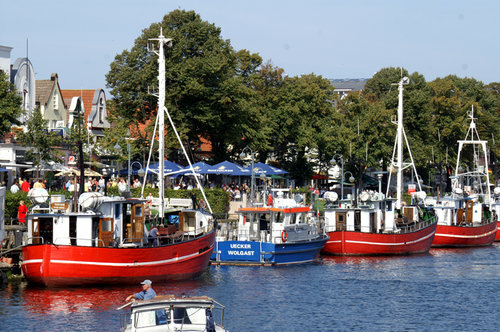 The tour starts with a stroll through Warnemuende, the fisherman’s village and seaside resort your ship docks in today. See the typical gabled houses of the 18th and 19th century with their half-timbered facades and ornamented doors and gables. The authentic “Old Stream” canal with its fisherman’s boats, boutiques, cafés and often street art performance is an absolute must-see. Above all towers the lighthouse of 1898 and the sandy beach. Maybe return here after the tour for an individual walk along the promenade area and some souvenir shopping or cake degustation. An approx. 30 min train ride away is the heart of Rostock, the biggest and most well known city of Mecklenburg county. This old hanseatic and university town offers a rich variety of sights and photo opportunities. During your guided walk of the historic center see the splendid town hall, lively market square, historic university, medieval monastery of the Holy Cross as well as the buzzling boulevard Kroepeliner Strasse and the brick gothic town wall and mighty town gates. An inside visit to the impressive basilica St. Marien with its baroque organ and fascinating astronomical clock of 1472 is another highlight. Your guide unveils the past and present of Rostock. Enjoy some time for browsing, shopping or a snack before returning to the port by tram and train again. Minimum of 4 passengers required to book this excursion.